How much does it cost to run a tower fan ? The cost of living isn’t cheap and all those additional things we need tend to add up over time. If you live in a cold climate you’ll have to worry about the price of heating. Likewise, if you’re living in a warmer climate, there’s the cost of cooling to consider. Plenty of people opt to use tower fans as a cooling method because you can easily move them around and they’re cheaper than other options, such as air conditioning. What does an Ionizer do on a Tower Fan? When it comes down to it, though, how much does it cost to run a tower fan? Which type of tower fan will cost you less in power consumption? It only makes sense to be aware of just how much your appliances will add to your power bill. If you’re wondering what a tower fan will cost to operate, take some time to look over the comprehensive evaluation below. How tower fans work is actually pretty simple: the fan just pushes the air outward without cooling it the way an air conditioner does. Because they don’t actually cool the air, tower fans consume far less energy than air conditioning units. 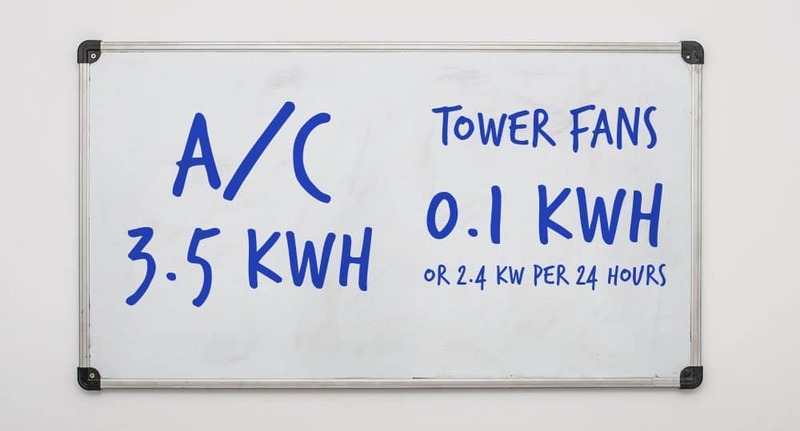 As J. Curtis of Top Ten Reviews points out, an air conditioning unit can consume up to 3.5 kilowatts per hour (kWh) while a tower fan only consumes about 2.4 kilowatts over a 24 hour time period. This amount will vary slightly based on what type of fan is being used and what setting it is on, which is something to consider. While a tower fan does cost money to run, there’s also the up-front cost of initial purchase to consider. Tower fans are generally far cheaper than other cooling appliances. However, based on the brand you choose to go with you may be looking at a bigger price tag. Tower fans can range in price anywhere from around $30 all the way up to $400 for the top of the line models. Most, however, will generally fall below the $100 mark (for the most part). 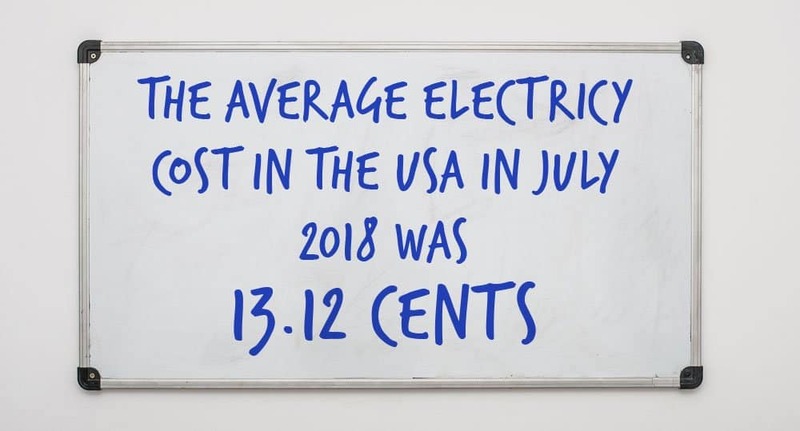 According to data compiled by Choose Energy, the average price of electricity in America in July, 2018 was 13.12 cents per kWh. Tower fans will use different amounts of electricity based on what setting they are on. For example, a fan left on the highest speed for several hours a day will cost you more than a fan left on the lowest speed for the same amount of time. In addition, different types of fans will consume different amounts of electricity. Most tower fans will have their wattage listed on the same plate that has the serial number. To figure out the kilowatt usage, you simply need to take the listed wattage and divide it by 1,000. An appliance that has a wattage of 1,500, for example, equates to 1.5 kWh. Given the average price of electricity in 2018, this means that a 1.5 kWh appliance would cost about 20 cents per hour. So how much does it cost to run a tower fan? Once you know the wattage, it’s fairly easy to figure out. The earlier example of a standard fan that used 2.4 kWh over 24 hours equates to 31 cents on your power bill for that time period. As Gary Foreman of Credit Cards notes, the average wattage of a high-velocity tower fan is 135 watts, or 0.135 kWh. Given the current average cost of electricity, a high-velocity fan running for 24 hours will cost you 42.5 cents. 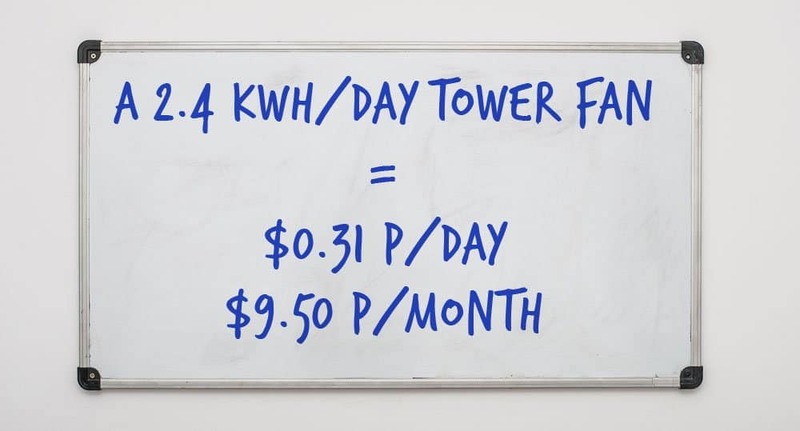 If you want to know how much a tower fan will cost you on a monthly basis, just use this formula: the hourly cost x 24 hours x 30 days. The average monthly cost of a high-velocity fan as listed above would be $12.75 and in comparison, the monthly cost of a standard fan would come in at $9.36. Tower fans are definitely an expense, but they don’t have to be a crippling one. If your budget allows for it, a high-velocity fan is obviously the ideal choice for long periods of hot weather. However, standard fans can be just as effective at keeping you cool as well, with the added benefit of lower overall running costs. Looking to find the best tower fan? Check out our guide.